Chasing Daylight : The Crop Circles of 2009 is a brilliantly woven documentary film by Steve Alexander, Rob Luckins & Karen Alexander ... Temporary Temple Productions 2009. 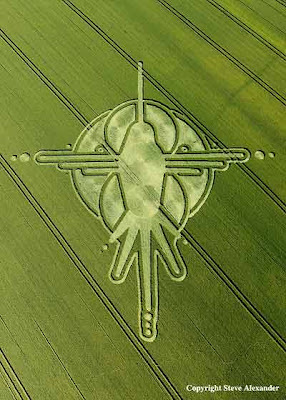 "Recording the crop circles as we do is not just a technical exercise. It is not a joy ride in a helicopter. It is a mysterious shamanic journey where inspirational images of the circles are exchanged for creative energy, imagination, and dreams and sleep. An intimacy is achieved between photographer and subject that transcends consciousness parameters, until by the height of the season, with long hours, early mornings, late nights, and accumulated sleep deprivation an altered state of consciousness is inspired and a channel of communication opens. We are often asked how we manage to take the pictures we do. We consider that we record the circles with the cooperation and guidance of whatever lies behind their creation. To consider the formations mere objects to be snapped at by a camera is to fail to fully respond to the depth of the phenomenon. For a short while each summer we give ourselves over to a measure of intoxication with the circles that allows us to do our work."
. . . ✿•*¨`*•.¸(¯`ॐ´¯)¸.•´*¨`*•✿ . . .